As of today, we have received 95 Kindness Kards back, which mean 95 acts of kindness have been performed that may not have been before our cards went out!! ~We have 12 states represented and over 34 cities! Things have slowed down a bit, but we're hoping for a big influx before the school year is over! _My name is Alyssa Gaibler and I am in Kindergarten at Bonny Slope Elementary School. After reading your kindness cards I decided to write a thank you letter to one of my favorite businesses, Donuts Plus, a donut shop in Portland. I chose that store because I really like donuts. My favorite donut is the kind with chocolate frosting and sprinkles. My Daddy and Beach Grandpa (we call him that because he lives at the beach) have been going to Donuts Plus since I was a baby. My Beach Grandpa REALLY loves donuts and buys some every time he comes to visit. The Donut Lady always asks us how Beach Grandpa is doing whenever we visit her shop without him. Last time Beach Grandpa went in to buy donuts she showed him the letter I wrote to her. She had it taped up on the wall! The Donut Lady is always happy to see us and she even gives us free donut holes. She also has the same birthday as Noah, my three year old brother. PS – We don’t know the Donut Lady’s real name, so we just call her the Donut Lady. ~This is the most beautiful heart-warming project, that made my day! ~My name is Addison. I am 3 years old. I was born 3 months premature. on 1-2-12 I found out that i have Acute lymphoblastic leukemia..Acute lymphoblastic leukemia (ALL) is a form of leukemia, or cancer of the white blood cells characterized by excess lymphoblasts. i have a big map. my brother is ten . he is showing me all the places your cards are going. thank you for letting us follow you another kindness your cards do- lets me and my brother share together. ~ Thanks for teaching our kids about random acts of kindness! Kindness Kards ROCK! ~I think this is awesome. 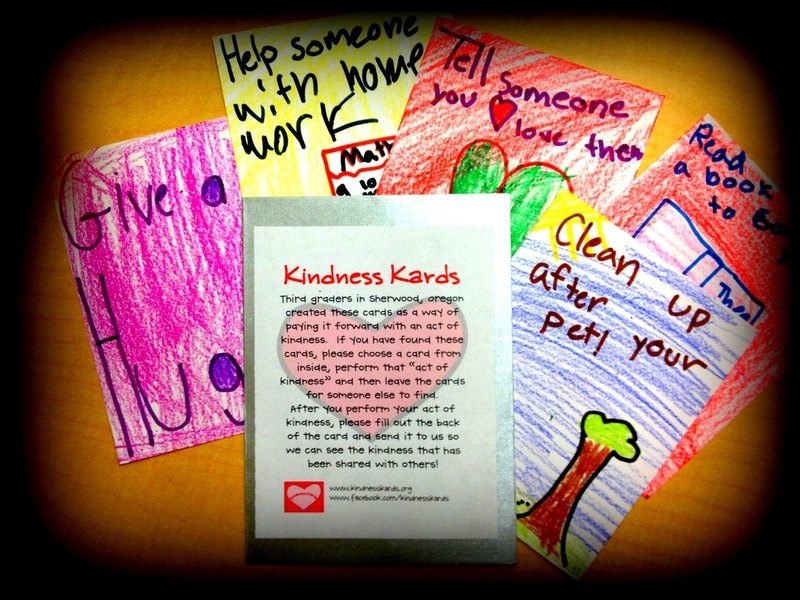 After we started our Kindness Kards, a lot of people have asked how they can get the cards of if they can make some cards. The answer is YES, of course! The goal is to spread kindness! If you want to get the templates the Kindness Kards Class used, just contact me. My friend teaches third grade at Scholls Heights Elementary in Beaverton and she wanted her class to participate. I was lucky enough to be able to visit the class to talk about Kindness Kards. They had already started making their cards and I was able to show them some of the cards we had received back. My class also sent along some advice for making cards and what to expect. The class was really excited and as of today, they have received 22 cards back, with three states represented. Some highlights for them were a man who adopted some kittens because of his card and a man who wrote that he resembles Dumbledore from Harry Potter! They are also trying to put their cards in order to see who left it where and who picked it up! What a fun idea!